Morgan James Publishing, 9781683506355, 114pp. Each year experts, odds makers, the polls, team records, tournament seeds, and the eyeball test mislead March Madness fans filling office pool brackets. 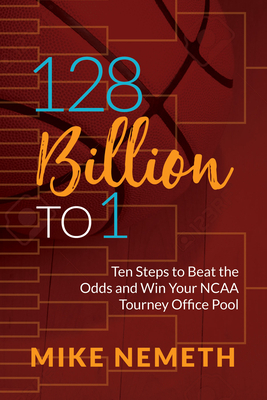 128 Billion to 1: Ten Steps to Beat the Odds and Win Your NCAA Tourney Office Pool by Mike Nemeth, explains the secrets and inner workings of the NCAA Tournament to exponentially increase one's odds of filling a winning bracket. It was written for basketball fans who want to understand why they don't often win their office pool. 128 Billion to 1 is a simple, yet ingenious guide to the way the NCAA Championship works, and explains the factors that best predict the outcome. Paramount among the factors is an accurate assessment of relative team strength to correct misleading polls and erroneous tournament committee selections and seedings. Using analytics, understandable mathematics and a dash of ingenious reasoning, Nemeth exposes the need for a new set of statistical measures to explain the outcomes of basketball games. The new statistics accurately rank each team entering the NCAA Tournament so that fans can make informed picks in their tournament brackets. Weekly accurate rankings can be found at https: //nemosnumbers.com/basketball-rankings/. Mike Nemeth is a retired Information Technology executive living in the Atlanta suburbs with his wife, Angie, and their rescue dog, Sophie. His previous works include Bestselling crime thriller, Defiled.